Another celebration is right around the corner, and we all know I LOVE a good themed care package. For our last holiday (check out the Valentine's Day post), I spent a lot of time on romantic gifts... but St. Patrick's Day is all about the fun! 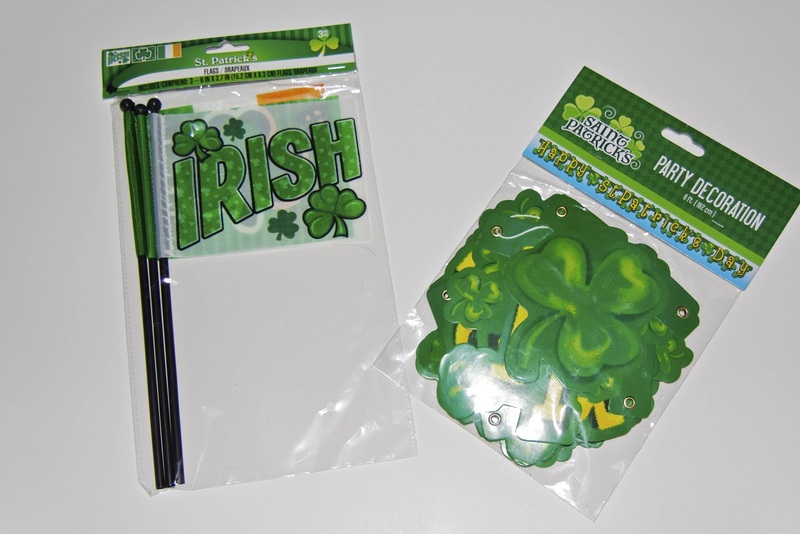 The Hubs is of Irish descent, so I especially wanted this package to make him smile. So let's get this party started! 1. Decorate the Box - As with other themed packages, decorating the box is always fun, both for you and your soldier. There are so many ways to make your box unique. For me, I always run to the dollar store first. Stickers, wrapping paper, scrapbook doodads, foam cut-outs... these are my bread and butter. All of them are a simple, and better yet, inexpensive way to personalize your package. Another popular way to decorate is: cover the box with reasons why you're lucky to have your spouse. Really go for it, and pick reasons that are special to you and your spouse. Be sentimental or be funny, or be something in between. 2. Words of Encouragement - The Irish have so many beautiful blessings and prayers. It's easy to find a few verses that could inspire your spouse. Is your spouse into music? Send a traditional Irish CD, or an iTunes gift. Search the internet to find blessings or sayings that you like, then have at it! These can be printed and framed, sent in a card, or doodled onto your boxes. Be creative, I'm sure your hubs will appreciate the effort. So many food items are green! 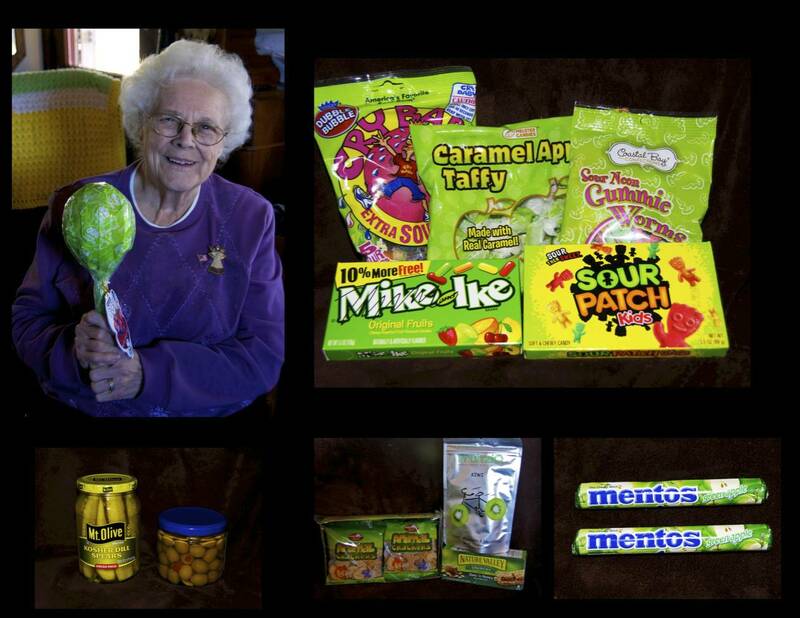 Try candy, granola bars, cookies, Rice Krispies treats, even pickles. Look through the seasonal sections of Walmart and Target, or try speciality shops like World Market. Many companies sell their items in seasonal wrappings, so it's easy to send your spouse's favorite items. Just because it's Saint Patrick's Day, that doesn't mean you can't send basic items that your soldier needs. Need new sheets? Buy green ones. Socks? Army green ones! Underwear? Same deal. My Hubs particularly wanted new shower shoes, so guess what he received? If you're looking for green, you'll be surprised by how many items you'll find. In fact, I had to stop myself from buying too much, there were so many options. 4. Party Supplies - Though your spouse isn't home to celebrate with you, it's nice for the soldiers to enjoy the festivities. Try sending hats, decorations, and noise makers. You can even send along themed paper plates, napkins, and cups. 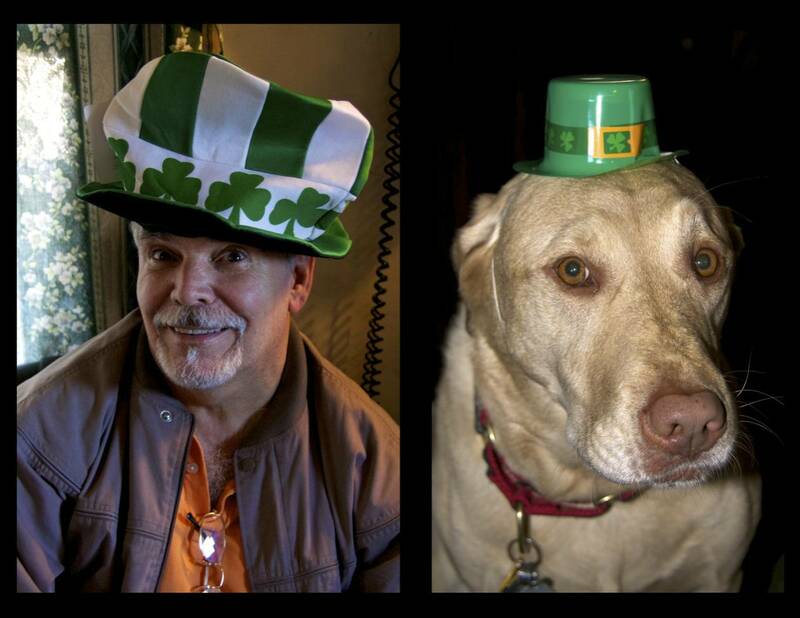 Thanks to my Dad and my puppy for being great models! I found these silly hats at the Dollar Store. Fun and inexpensive, that's my motto! Decorations are also easy to come by at the same store. For holidays like this, discount stores are great place to start your shopping. 5. Fun and Games - Every box should have a little fun in it. Try puzzle books (with green covers, of course! 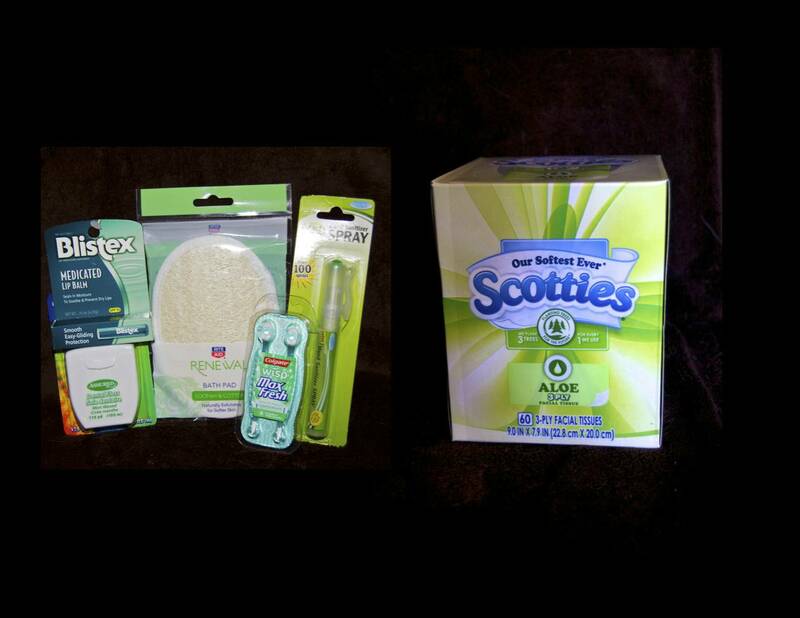 ), green pens, or video games wrapped in green tissue paper. If your hubs is a cinema fanatic like mine, send movies that take place in Ireland. Or movies with Irish actors/directors. Silly toys are great too. Or gag gifts. I love the cheap t-shirts you can find at Walmart with goofy pictures and sayings on them. Try to stick with your green theme, and just about anything will fit in. 6. Photos - I suggest these for every care package you send. I bet most soldiers loves to receive pictures. 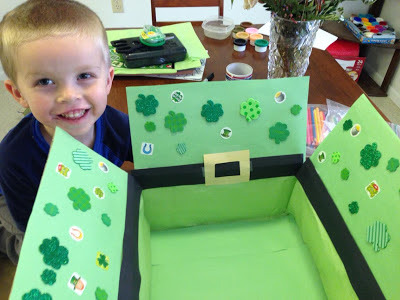 Try printing some from the last Saint Patrick's Day you shared together, and sending them in a green frame. Websites like Shutterfly and Snapfish are also excellent resources. 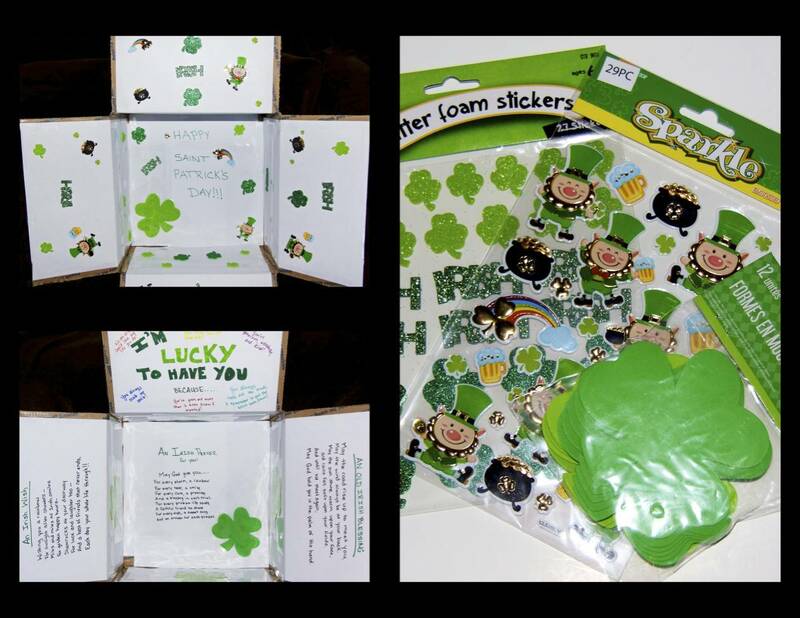 They offer themed options, so you can print regular photographs with a Saint Patrick's Day border. Running low on time? Many Walmarts and drugstores have same-day printing, and they usually offer themed borders as well. 7. "Irish" Goodies - An often requested item for care packages is coffee. Why not send Irish coffee for St. Patty's Day? If you can't find the coffee, look for flavored syrups or non-dairy creamers. Perhaps your soldier even prefers tea. Other fun goodies are oatmeal, oatcakes, or jams. 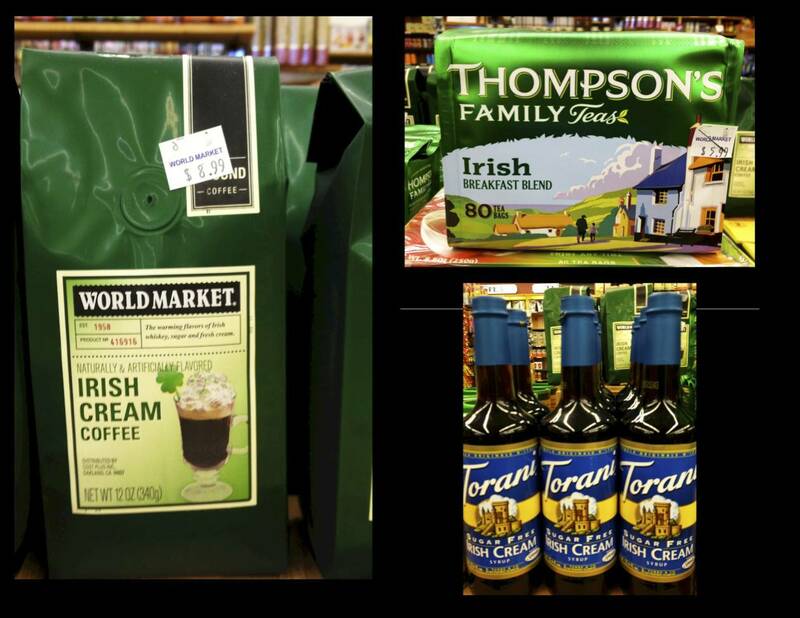 If you have trouble finding these Irish goodies, try Amazon or your local World Market. a. Gold Coins - label with "I TREASURE you"
b. 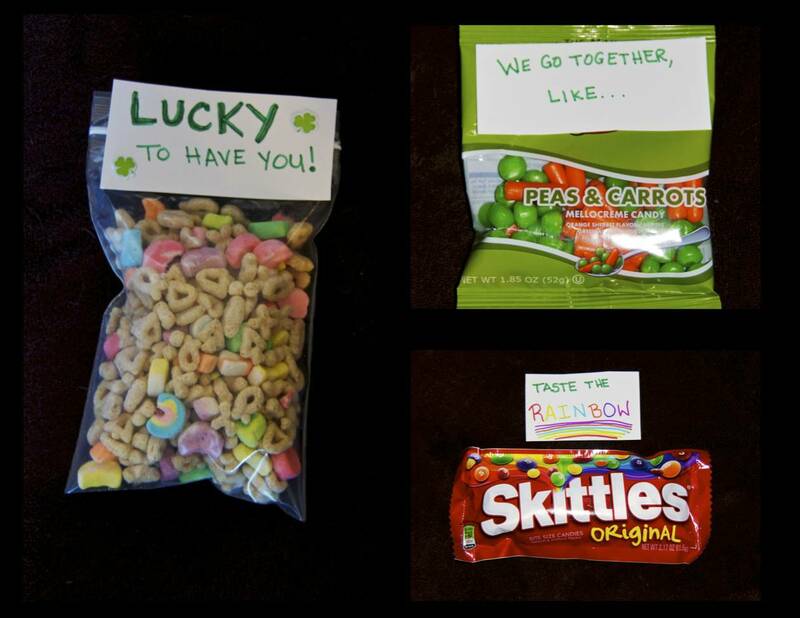 Lucky Charms cereal - label with "I'm LUCKY to have you"
c. Skittles candy - label with "Taste the rainbow" or "You're better than the pot of gold at the end of the rainbow"
d. Hershey's Kisses - label with "KISS ME, I'm Irish"
e. Rollos candy (loose, in a clear bag) - "You're the pot of gold at the end of my rainbow"
If you know any other fun sayings, please feel free to share in the comments and I'll add them here (and credit you for the idea!). * The Peas and Carrots were found at the Dollar Store... never seen these before, they're cute and fun! 8. Artwork from the Kids - This is good for any care package, and will always be on any list I make. You can work with the St. Patty's day theme, of course. Most craft stores sell seasonal craft kits for less than a few dollars apiece. 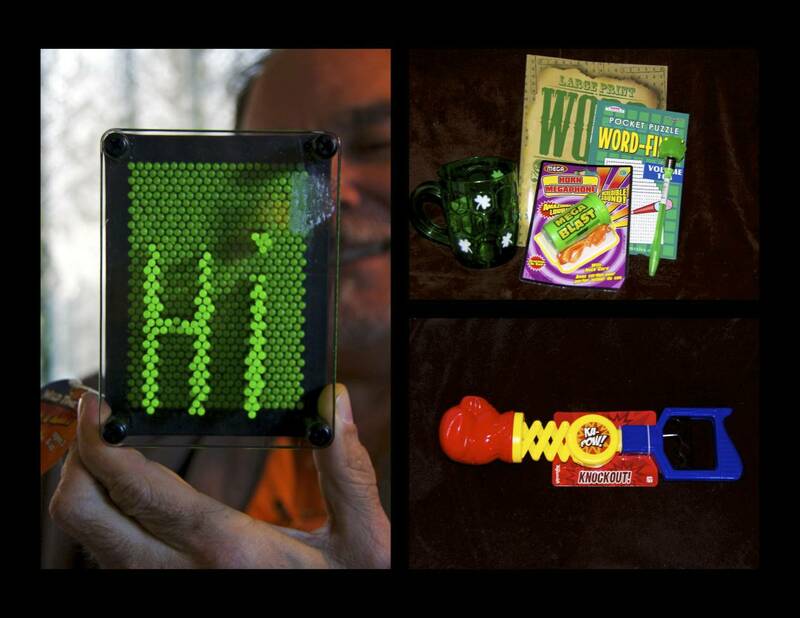 Not only are these great to send your spouse, but it's a cool project for your kids and a great excuse to spend some time together. 9. Cards and Letter - Perhaps the most important part of any care package! I know not all of us are comfortable writing, and we don't always know what to say, but that's ok. A simple 'I love you' and 'I miss you' can make a world of difference. Look for cards that express your feelings, or find a funny one that would give your spouse a laugh. So, that's all I've got for now, folks! 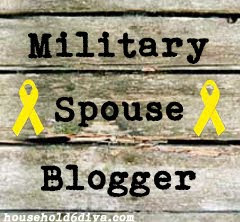 I'd love to hear from you with other ideas to inspire fellow spouses. Feel free to share your thoughts, even your photos. Submitted by a friend who is probably blushing right about now (and who wishes to remain anonymous)! 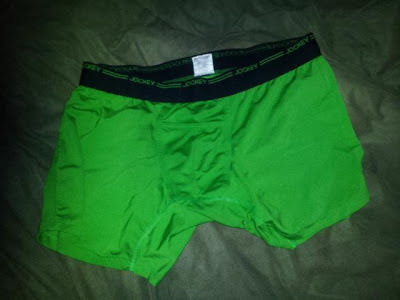 Undies are festive AND practical, plus they make great packing material! © Allison Moore. All rights reserved. Powered by Blogger.